Boil pasta, and when left time 30seconds, add the green asparagus and finish boiling. Pour Olive oil in the pan, and fry the mushrooms. Add garlic and fry until it gets roasted. Add fresh cream in 3, and room temperature cream cheese then boil and melt it. Add 1 in 4, and add salt. Decorate in on the plate and spray on the pepper. Warm and pull out the Shuto's aroma by the touch of the pan. Then put the boiling water and melt so the Umami will come out effectively. We select fresh Bonito from the inshore. We can only get 30 to 40g stomach and intestine from one Bonito(4 to 5kg). And these will be salted and aged in a long term fermentation. For the rich natural Umami component and amino acid, it goes great with Sake, hot rice. 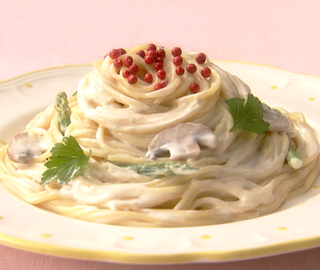 Also you can use it as Japanese anchovy and make several delicious dishes. Shiino Foods will bring happiness to people as a General food manufacturer of Shuto "Japanese anchovy" and other Japanese food. Copyright ©2010 SHIINO FOODS CO.,LTD. All Rights Reserved.